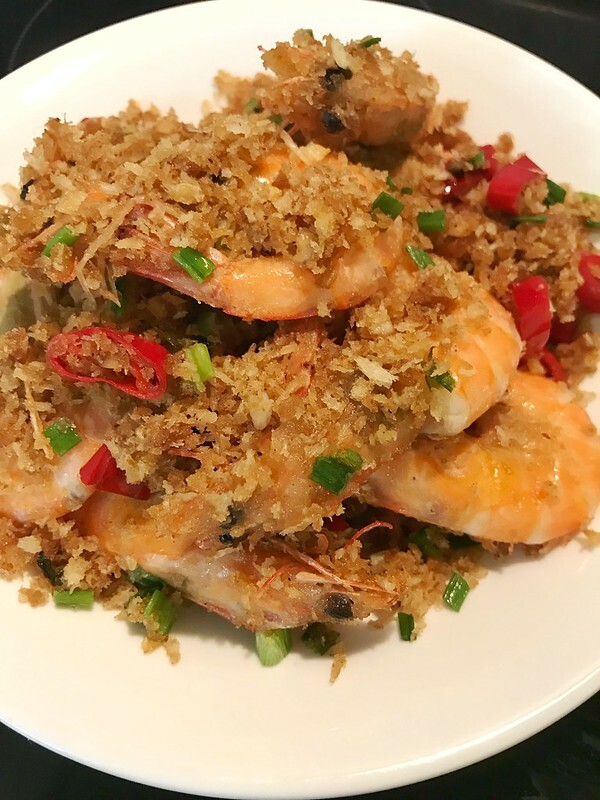 This is a very popular dish in China, especially in southern part. And I think it’s originated from Hongkong. 1. Prepare prawn. Remove the intestines with the help of toothpick. 2. Put Prawns in a bowl. Add in 1/2 tsp salt, 1 tsp white pepper powder and 1 tablespoon cooking wine. Marinate for 15 mins. 3. 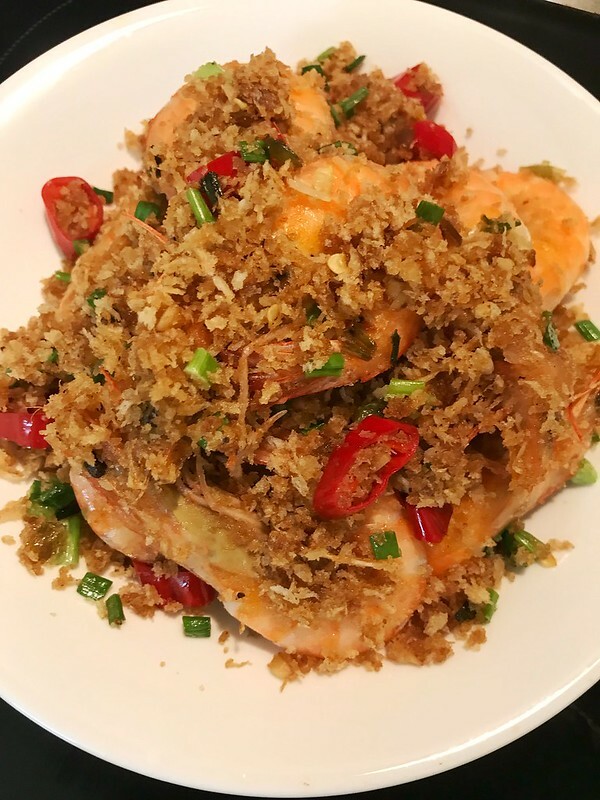 While the Prawns are marinated, you can prepare other ingredients: 3 cloves of chopped garlic, a little chopped ginger, 2 chopped red chili, 2 chopped spring onion and 1/2 cup bread crumbs. 4. Wipe the Prawns with kitchen towel. Mix them with 2-3 tablespoon corn starch. And let them be coated with starch. 5. Deep fry them till golden brown. Set aside. 6. Heat 2 tsp oil in the pan. Sauté ginger, garlic red chili and spring onion till aromatic. 7. Add in 1 tsp sesame oil, 1 tsp soy sauce, 1/2 tsp salt, 1 tsp black pepper, 2 tsp sugar and 1 tablespoon cooking wine. Stir to let the sauce reduce. 8. Add in bread crumbs. Stir fry to bring bread crumbs brownish. 9. Add all the fried prawns into the pan. Stir fry to mix them evenly. My husband loves it very very much.